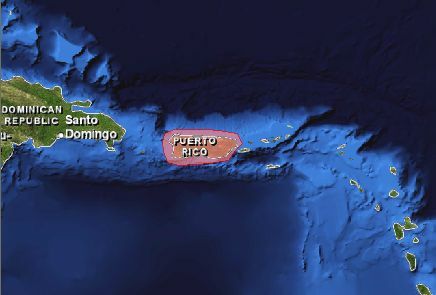 Puerto Rico is a volcanic island in the Greater Antilles located in the north central Caribbean between the U.S. Virgin Islands to the east and the island of Hispaniola to the west. It is an archipelago comprised of the main island, the islands of Mona, Monito, and Desecheo in the Mona Passage, Caja de Muertos Island on the south coast, Vieques Island, Culebra Island, and a series of smaller islets, the "Cordillera de Fajardo." 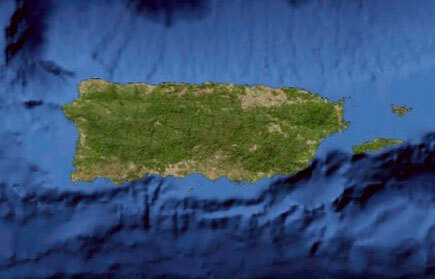 The land area of Puerto Rico is comprised of coastal lowlands, a mountainous interior, and a karst area in the north. The central mountain chain is oriented east to west, with most of the major rivers flowing toward the northern shore. Other major mountain ranges are located in the northeastern, southeastern and northwestern regions. The island has no natural lakes. The climate is tropical marine with average coastal temperatures of about 26 °C (80°F), slightly cooler in the interior. Puerto Rico is mostly surrounded by deep water. The Mona Passage, between Puerto Rico and Hispaniola, is more than 1,000 meters deep. The Puerto Rico Trench (the deepest part of the Atlantic Ocean), off the northern coast, is 8,500 meters deep, and from the southern coast, the ocean bottom descends to the Venezuelan Basin (5,000 meters). Puerto Rico has a diversity of unique terrestrial and marine ecosystems including coastal mangrove forests, seagrass beds, coral reefs, tropical rain forests, tropical dry forests, and coastal plains. The archipelago harbors a diverse flora and fauna with a high level of endemism. The island has a linear coastline of 620 km, surrounded by over 5,000 km2 of shallow coral reef ecosystems. High population density and land uses have resulted in harmful impacts to the coral reefs, by sedimentation, eutrophication, and pollution, further compounded by algal growth and overfishing. Coral bleaching, diseases, invasive species, and physical damage have also contributed to the declining health of the reefs. Chapter 16 - Status Of Coral Reefs in the U.S. Caribbean and Gulf of Mexico: Florida, Flower Garden Banks, Puerto Rico, U.S. Virgin Islands, Navassa. In Status of Coral Reefs of the World: 2008. Edited by Clive Wilkinson. Search the CoRIS Geoportal for Puerto Rico metadata, data and publications. Select "U.S. Caribbean" in the region window and "Puerto Rico" in the Country window.